American Express Card's (Amex) 30licious promotion (#30liciousAmex) is back again from 3 November 2014 to 2 December 2014. Festive season comes early with the 30 days of delicious deals, paying only $30++ for your set meals at participating restaurants using your American Express Card (Amex). All you need to do is booked online a http://book.hungrygowhere.com/30licious and pay using your Amex card. You will be spoilt of choice with more than 30 over restaurants taking part in this promotion. After browsing through the list of restaurant participating in the American Express Card's (Amex) 30licious from 3 November 2014 to 2 December 2014, I decided to check out Spruce at Phoenix Park which is nestled among the greenery. 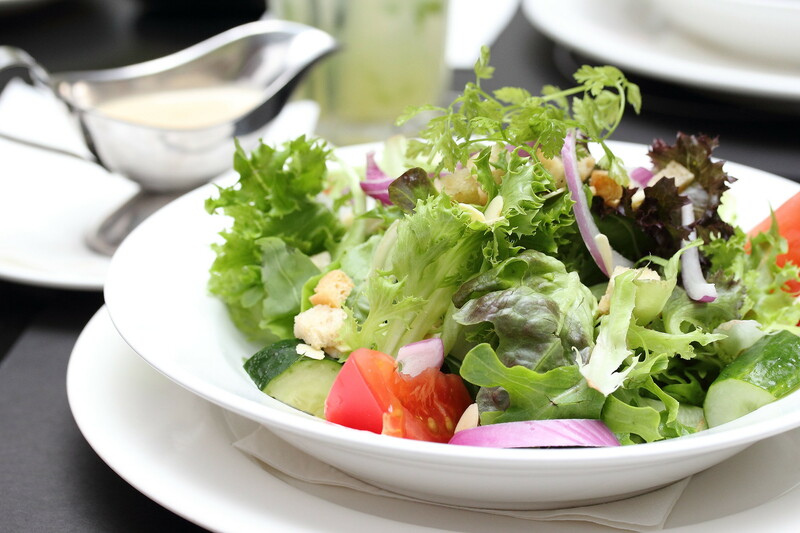 The #30liciousAmex dinner menu considers of a House Salad, a choice of Mains with a choice of Drink. For the choice of Drink, one can choose to have coffee/tea, soft drink or homemade lemonade. I decided to go for the Homemade Lemonade. 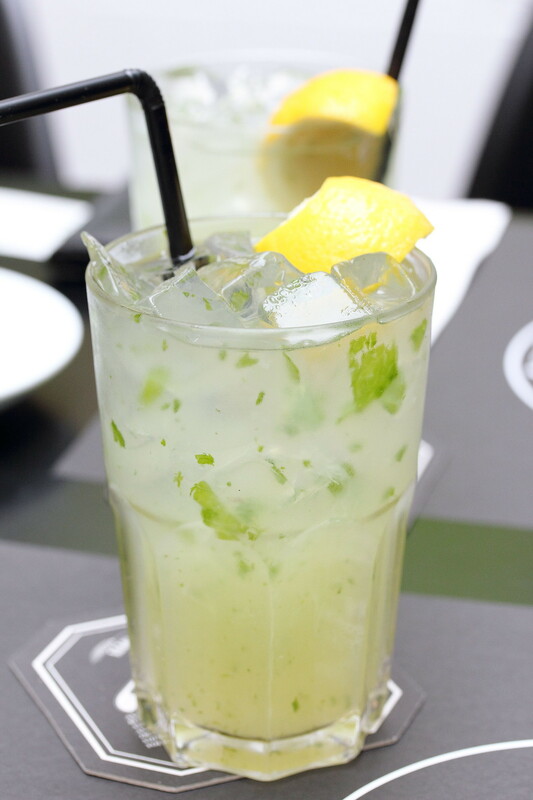 It was a refreshing choice of the humid Singapore weather and I like the addition of mint leaves to give in the extra refreshing boost. 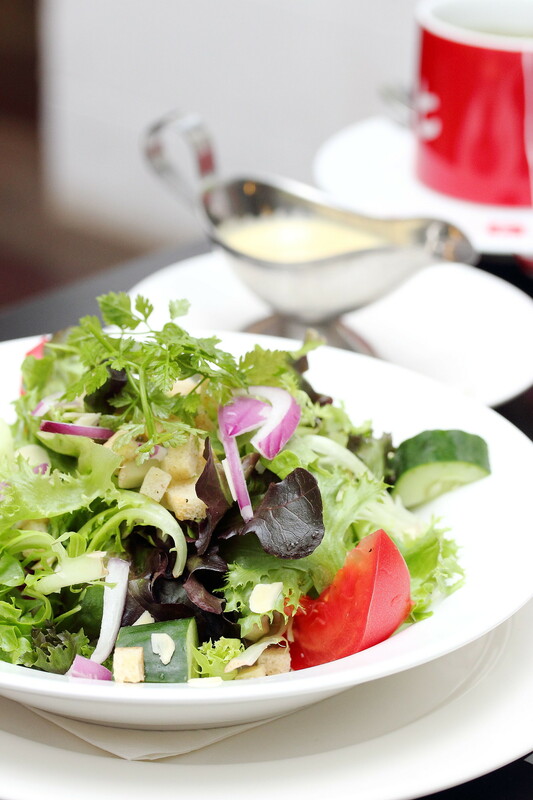 The House Salad consists of fresh greens, cucumbers, onions, tomato and almonds with a choice of dressing. I opted for the champagne dressing which has a nice tanginess that complemented the freshness. I applauded the used of almonds to give the salad the extra crunch. 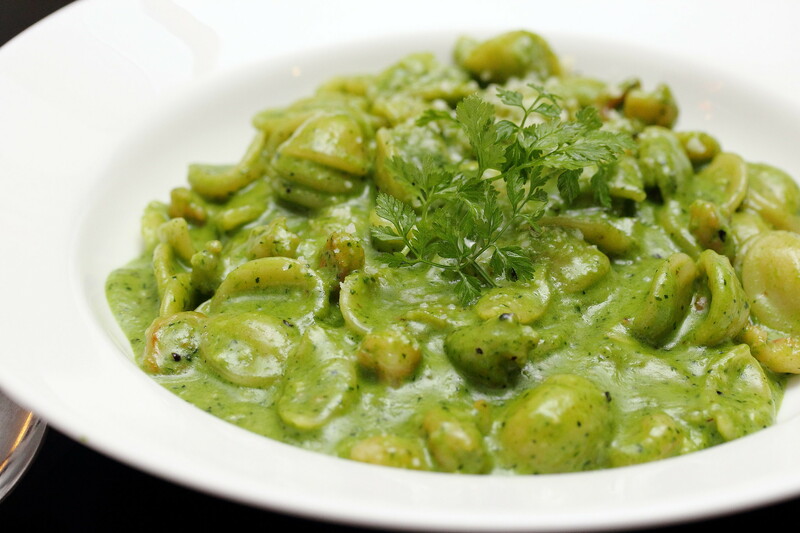 For the #30liciousAmex set menu, one has the choice of mains in the chicken pullet or any pasta dish on the menu. 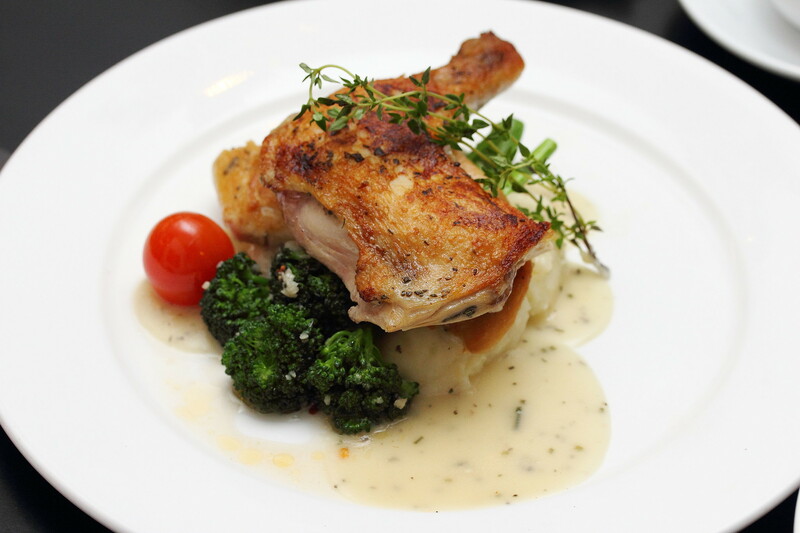 The Chicken Pullet comes with Desiree mashed potato, seasons vegetables and rosemary veloute sauce. The oven roasted chicken has a nice exterior crisp on the skin while the inside was still tender and moist. The rosemary veloute sauce is an excellent pairing for the chicken allowing the natural flavour of the chicken to shine but not over dozed it with richness. No matter how I looked at it, the green coloured pasta does not in any ways look like a Prawn Pasta dish. Do not be misleaded by the look, this is probably one of the best pasta I ever had. Buried in a delicious spinach and zucchini sauce with chopped sea prawn which explained the greenish colour. This is beautifully finished and topped with grana padano cheese enhancing the whole taste. I like my pasta to be rich and creamy and the Squid Ink Carbonara definitely hits the spot. 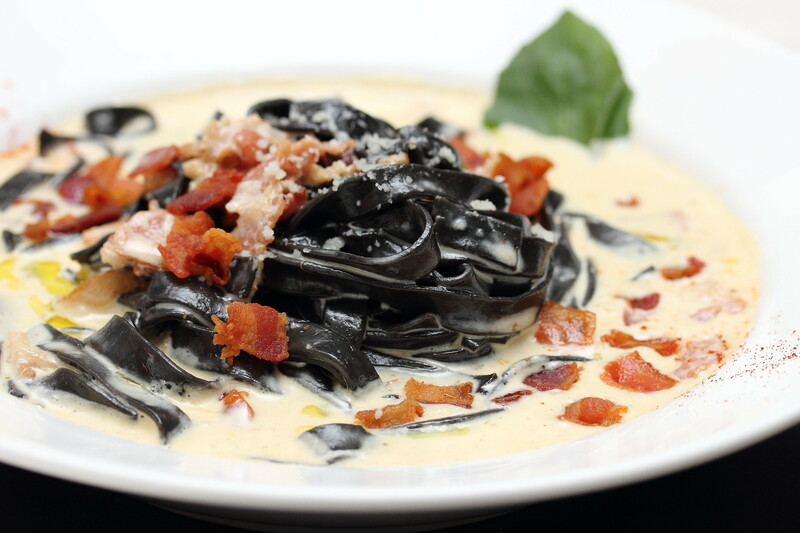 Usually squid ink pasta is quite one dimensional but the combination of using squid ink tagilatelie in carbonara sauce and bacon have given it layers after layers of slurping enjoyment. To enjoy this great #30liciousAmex deal for $30++ set menu, book online and pay with your American Express Cards from 3 November 2014 to 2 December 2014. So do not missed it, make a reservation now at http://book.hungrygowhere.com/30licious. We always say that we have an extra stomach for dessert. How true is it and with the saving from the #30liciousAmex set meal, I would gladly ordered additional desserts to wrap up the delicious dinner on a sweet note. 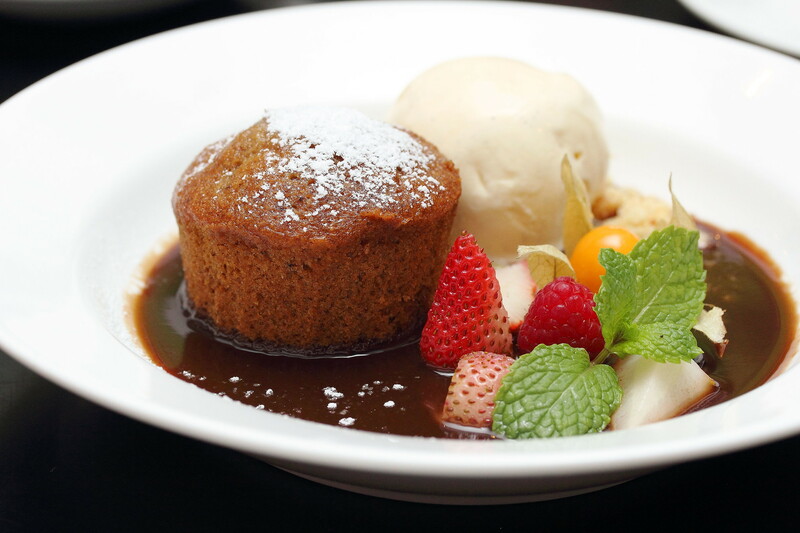 Tried a couple of the desserts on the menu and my favourite was the Baked Ginger Date Pudding Ala Mode ($15). Warm, moist and comes with hints of ginger flavour. This is heavenly paired with a scoop of vanilla ice cream and chocolate sauce. 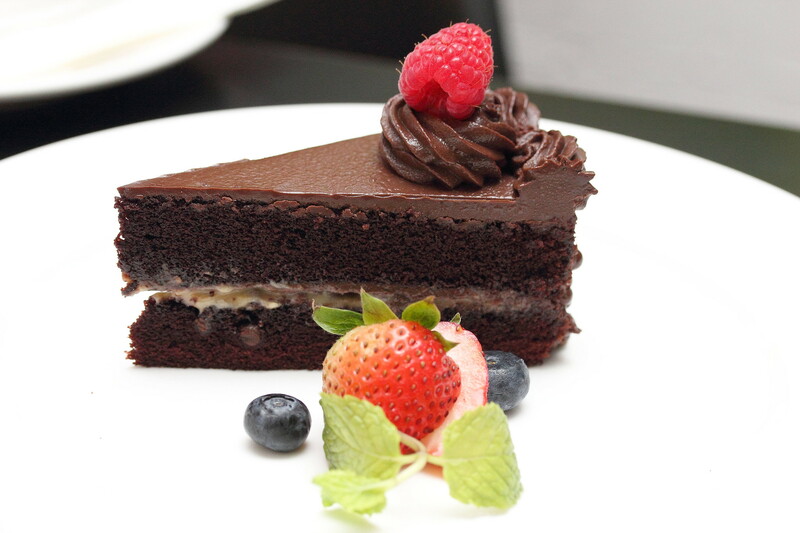 A delight for chocolate lover is the Double Chocolate Crunch Cake ($12). The different layers of rich goodness will bring a smile to all chocolate fans. 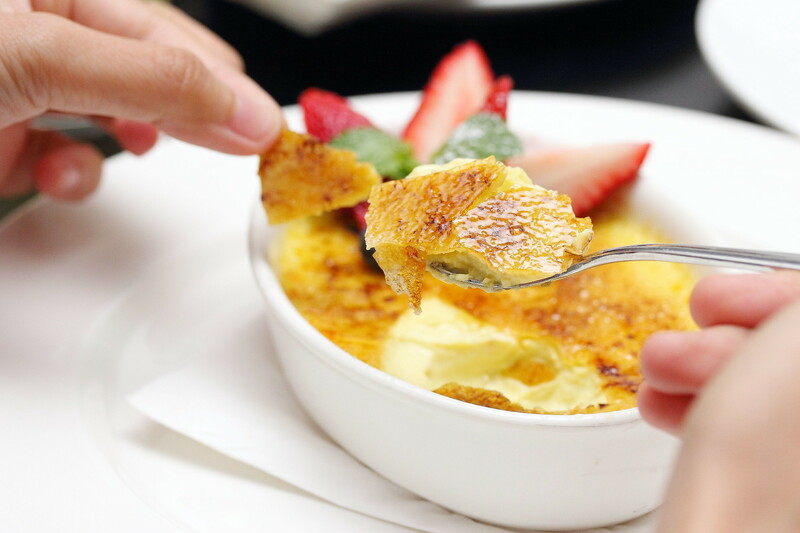 The crackling Creme Brulee ($15) does not have an eggy taste but instead it is infused with the lovely fragrant of pandan. A nice Asian twist to the classic dessert that will suit the local palate. Both Spruce outlets at Phoenix Park and Bukit Timah Fire Station are taking part in the American Express Card #30liciousAmex promotions. Remember to book via http://book.hungrygowhere.com/30licious to enjoy the delicious deals.